Marvel Knights Spider-Man #2 and What Is This Series? Home » B Titles » Marvel Knights Spider-Man #2 and What Is This Series? 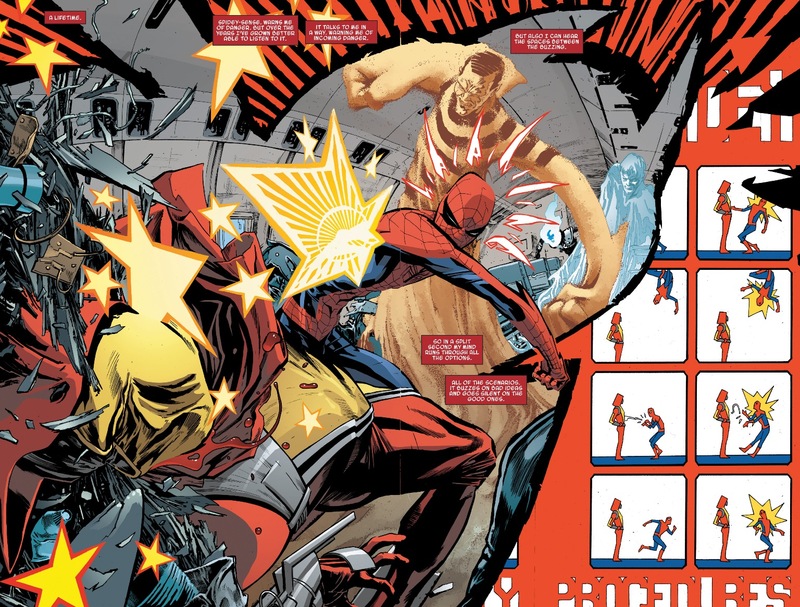 Two issues in and I’m still hard-pressed to say with any confidence what my overall impressions are of the Matt Kindt/Marco Rudy Marvel Knights Spider-Man collaboration. After a trippy, psychedelic opening issue, a part of me was wondering/hoping that the second installment would settle into a more traditional narrative for a Spider-Man story. But Kindt and Rudy continue to push the envelope with their creative output. In a vacuum, I think these first two issues have been really fun and interesting, but the fact of the matter is the series is just so damn different from any other kind of “mainstream” Peter Parker as Spider-Man story I’ve read before, that the “Spider-Man was my childhood hero” part of my brain is having a hard time embracing these comics. Maybe I just need to get over things, because I really can’t find many creative flaws with these two comics. 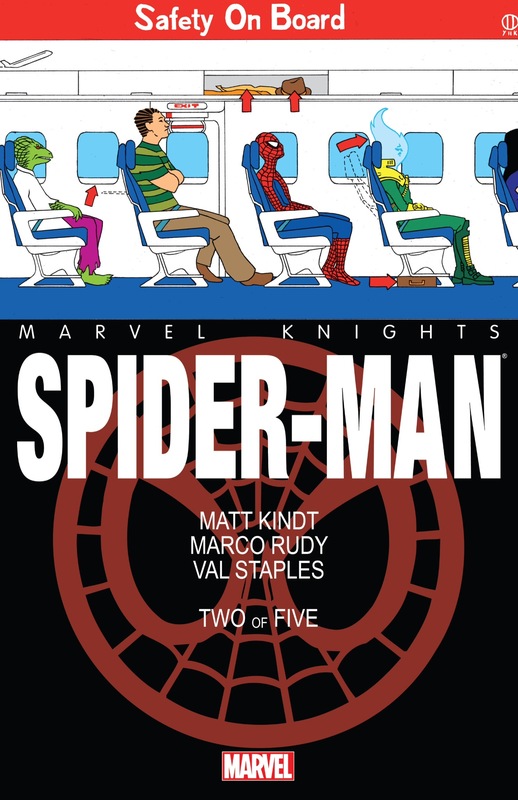 Kindt’s script pays homage to the history of the Spider-Man universe, while also offering a very unique, much more psychological take on many of its characters. And I continue to be amazed by the eclectic-nature of Rudy’s pencils – my goodness is this book’s art impressive. The mishmash of styles may not suit everybody’s tastes, but for reasons I still can’t exactly put my finger on, Rudy’s output just clicks for me. As good as the book looks on paper, it’s even more impressive on the high-definition output of my iPad. Considering I’m one of those “weirdos” who tends to value story over art in my comic books, the fact that I find myself staring at this comic just to absorb the art, is a true testament to what Rudy has accomplished here. The premise that Spider-Man is fighting “99 villains” is one that can easily fly off the rails – it’s like a gauntlet story on steroids – but Kindt manages to keep this thing grounded and conjures up interesting little nuggets about some of these villains, many of which I’ve never even considered. Spider-Man’s fight with the Sandman is especially unique, and given the fact that good old Flint Marko has been a part of the comic book universe for more than 50 years, I think Kindt really keys in on some fascinating ideas for this battle. The line about how Marko’s sand body initially inspires memories of a more tranquil time for Peter (when he used to play on the beach at Coney Island), is hands-down the most Proustian thing I’ve ever read in a Spider-Man comic book. Kindt follows up this sand-inspired madelienie with the yuckier concept of how Sandman could be touching/choking Peter with literally any part of his anatomy at any given time. Such a thought is definitely designed to play up the “ick” factor of Sandman, but it’s also a very fresh idea from Kindt that adds another layer of drama to this Spider-Man/Sandman battle and all future ones. In Spider-Man’s battle with Hydro-Man, the villain demonstrates a new “trick” when he starts sucking all the water out of Spidey’s body. Kindt’s writing of Spider-Man here is especially interesting in that the character is both incredibly impressed and terrified by Hydro-Man’s evolution. And considering how much of a C/D-lister Hydro-Man has been reduced to over the years (has he really ever been an upper crust villain? ), Kindt deserves credit for thinking up of a new way to make him more formidable. 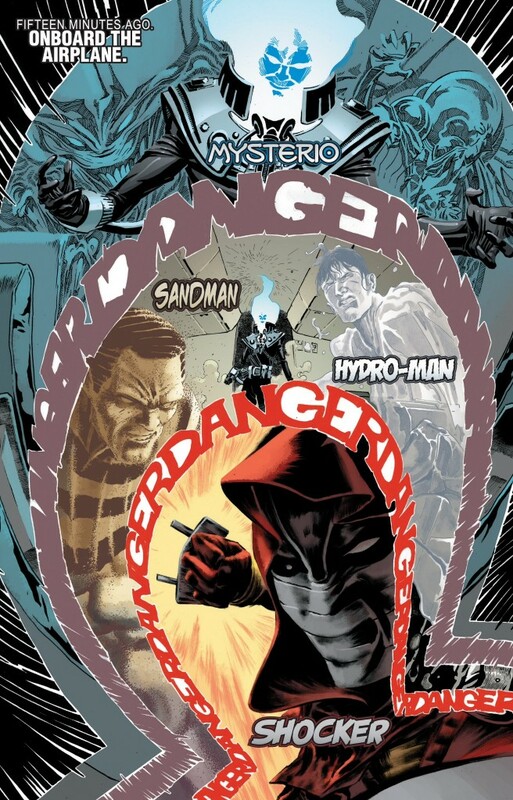 Similar to his writing of Sandman, Kindt uses the Hydro-Man battle to expose nuance in the painfully obvious. 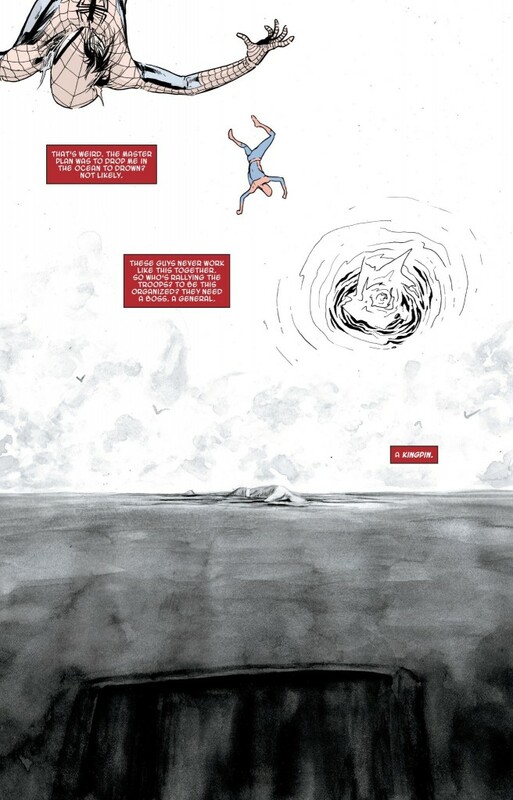 While water is being sucked out of his body, Spider-Man’s thinks about how he needs to cope with the fact that all of these villains are out to kill him. Obviously, the threat of death looms over Spider-Man every time he heads out into battle (and this idea was commonly brought up by Mary Jane during the time the two were married), but to hear Spidey so plainly question Hydro-Man, “what was your life like that brought you here? To make you kill a guy?” came across as especially poignant for me. I realize after my recent interview with Kindt at New York Comic Con that he didn’t specifically go out to create a “darker” Spider-Man story just to fulfill some arbitrary requirements for the Marvel Knights imprint, but there’s definitely a level of maturity to Peter’s inner-monologue in this scene that we don’t typically get in other Spider-Man comics. And that’s exactly where the rub is as it pertains to my feelings about this specific comic, and the series as a whole (all two issues of it) thus far. I really like this cerebral examination of Spider-Man. 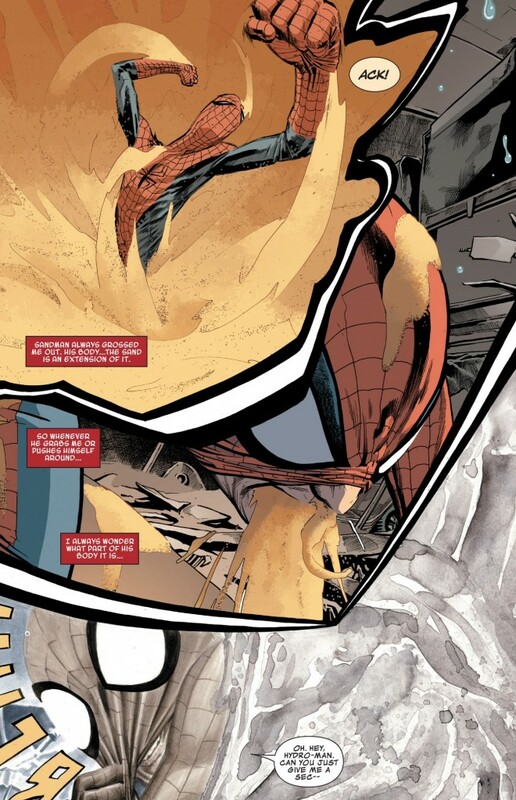 Some of the most successful stories in Spider-Man’s history like “Kraven’s Last Hunt” and the “Death of Jean DeWolff” came across as being dramatically different from their predecessors in large part because these stories focused more on the psychological elements of Spidey’s character rather than the heroic ones. But I also accept the argument from some who don’t think of these two stories as being “true” Spider-Man stories. “Kraven’s Last Hunt” was originally written for Batman after all, and Death of Jean DeWolff,” as wonderful as it is, ends on a note that comes across as so out-of-character for Spider-Man, I’m surprised it’s as beloved as it is by Spider-Man fans (more on that another day). Obviously it’s way too early to even mention Kindt’s Marvel Knights Spider-Man as being on the level of “Kraven’s Last Hunt” or “Death of Jean DeWolff” (despite the fact that I just made the comparison), but I think the greatness of these stories serve to remind me that different is not always a bad thing when it comes to my Spider-Man comics. Granted, Dan Slott’s work on the Superior Spider-Man reads more like a soap opera, akin to the days of Stan Lee and John Romita Sr. and ultimately, that’s the version of Spider-Man that I fell in love with and made me a superfan (despite that creative team working together decades before I was born). It’s even more probable that I’m providing a disservice by dissecting Kindt and Rudy’s work installment by installment rather than waiting a few more months to consume and analyze the whole thing as one work, but as I alluded to last time I talked Marvel Knights, I’m just excited to be able to wax poetic about Peter Parker in a comic again so it’s difficult for me to table my thoughts on these issues for one big idea dump in February. So until then, I guess I’m going to keep pumping out these reflections where I sound equally impressed and befuddled by the giant plate of “different” being served up by Kindt and Rudy.